Our campers attend daily instructional activities based on their own interest, often with similarly inclined cabin mates. Cabin groups gather up for meals, spend rest period together, and will often enjoy a Cabin Night or similar bonding evening time. 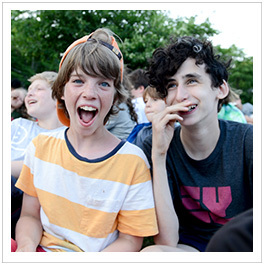 With Meg and Peter's guidance, counselors work prior to camper arrival and throughout the session to create a warm, welcoming and inclusive cabin environment. Cabin activities may include a swim at rest period, campfires and s’mores, crafts, games, and more on Cabin Night, puddle-jumping when the weather and mood are just right, or mellow “downtime” in the cabin. 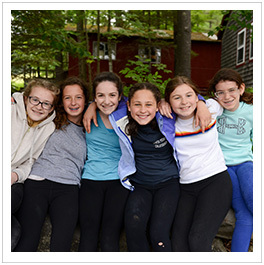 Prior to the camp session, staff get to know their campers “on paper,” and then connect with each child upon arrival at Hidden Valley. We call parents with a first-week update. Cabins eat meals as a group, and enjoy rest period and other special times together as well. Meg and Peter meet regularly with counselors (3-4 staff per cabin) to monitor the progress of their cabin communities. Named after: The idyllic undersea kingdom of course! Named after: A legendary island from the tales of King Arthur and the Knights of the Round Table. Arthur was taken to Avalon to recover from wounds. It is also the place where King Arthur's sword, Excalibur was forged. Named after: Its beautiful front porch reminded Peter and Meg of an old country cabin. Named After: The Burrow came into existence in 2010 when Peter issued a formal permit for a name change to the campers in the cabin formally known as Ritz Down. After signing the documents a new sign was made and the cabin officially became The Burrow. Named after: Built during the camp's Utopian phase. Camelot was the castle from the tales of King Arthur and the Knights of the Round Table. Named after: A lovely place in Big Sur where Peter and Meg stayed a long time ago. Named after: The HV community service and leadership program which live here. Named after: The huge 7 acre front yard, winter home to grazing Bambis. Named after: Inspired by our Aussie and Kiwi counselors and the fact it is below our dance studio. Named after: The camp's central building dating back to HVC's agricultural days. Named after: An old Irish legend of a village of paradise that sailors searched for if their ship sank. Named after: The eponymous film. Beware! Named after: A=In honor of a group of campers from New Orleans. Named after: Peter’s favorite Rolling Stones song. Named after: For years this cabin was called “Brumby” in honor of the wild horses of Australia and in fact this building is sometimes the home of our Brumby campers, with a new name inspired by the many stars visible from the top of Brumby Hill and for Comet, a famous race horse. Named after: It really is a carriage house from Hidden Valley's days as a farm. Named after: Duh, 'cause it's made of bricks?! Named after: Officially "The Loons" after the Maine State bird, not the crazy cabin inhabitants! Named after: Paquatahnee means "off the beaten path" in local Native American dialect. Named after: The Program Directors who inhabit the building during the summer. Named after: The famous hotel; just don't expect room service in this one. Named after: As the camp's largest cabin, why not a grand namesake?! Named after: Tipi Village really is a village of it's own. It consists of 3 tipi's, a kitchen, compost toilet, water well and lots of trails and nature! Named after: The Robert Lewis Stevenson classic novel. Named after: A Norwegian Legend where Valhalla is a big and majestic hall that soldiers travel to in the glorious afterlife to join fellow soldiers and past kings. Named after: Wabanaki means "Children of the Light" in local Native American dialect. Named after: "Underground, Overground, Wombling free. The Wombles of Wimbledon Common are we. Making good use of the things that we find. Things that the everyday folks leave behind." Named after imaginary creatures in British children's literature. Wombles live in burrows on Wimbledon Common and rummage in garbage and recycle all that they find into ingenious new inventions. HVC’s cabins are open, airy and fun. Campers are grouped by age or grade in these 24 unique structures. Each cabin has full bathroom facilities (shower, toilet, sink, etc.) electricity and ample space for groups to gather. Atlantis: Formerly named Last Resorts I. Atlantis was not named at all until 1983! Avalon: Avalon is right in the backyard behind the swing set and tetherball. Bermuda Triangle: So named because you can't find the photo here. Sometimes we combine Atlantis and Treasure Island to form a larger "Bermuda" group. Blue Moon: It's the closest cabin to both the lake and the ropes course. Lucky, lucky. Halley's Comet: This cabin houses our horse-crazy Brumby campers, and its great view has us thinking about the night sky here. The Burrow: Formally Ritz Up: Can you guess why? Tiny hint: It’s upstairs from Ritz Down. Camelot: Has a great campfire site nearby. S’mores anyone? Chateau Fiasco: Originally called Riverside and hoe to HVC's "pillow-fight" stained glass window..
Community House (Also known as Blodgett House): President Theodore Roosevelt stayed here during a late 19th century hunting expedition. Deer Meadows: Used by HV Alive during the August Session. Has a kitchen! Down Under: Right by the stream, perfect for hot afternoon creek walks. Farmhouse: The Kassen's home! The farmhouse used to sit atop Tipi Hill and in the early 1900's was rolled down the hill on logs and pulled by Oxen to it's final resting place in the center of camp. Fiddlers Green: Is near the hoops court and you will occasionally find a camper crawling underneath to retrieve errant basketballs. Forbidden Planet: Formerly the old Riding Cabin because it formerly housed our horse program girls. French Quarter: The second largest cabin (Taj Mahal is the largest, of course) at HVC. Gimme Shelter: Has a great addition on the side which is the home of many an exciting poker game. Lower Carriage House: If you go into the Upper Carriage House, you can see the mechanism used to raise and lower carriages from when HVC was a farm. Log Cabin: Built by '70's campers, including Peter's brother. Now home to HV Adventures. Loons: Peter's favorite cabin because it's so roomy. Paquatahnee (pronounced pa-kwa-tah-nee): Has a beautiful stained glass window of a waterfall made by Wandrea. PD Barn: The PD barn was a dairy barn until renovated in the 1950's. Ritz Down: Can be used as a winter dwelling, and has a dance studio next door! Shangri-La: Used to be named “Utopia” but a real utopia is better than a generic one, right? Taj Mahal: HVC's largest cabin, and the only cabin without an identifying sign. Tipi Village: Campers live in Tipi Village for 2 weeks. 6-10 campers live in the tipi's at a time with 2 counselors. While in the village campers learn about native american culture, nature crafts and activities, hiking, swimming, lots of campfires and native american games and lore. Treasure Island: Formerly called Last Resorts II. It's the only cabin with it's own tetherball pole. Valhalla: During a blizzard, a huge oak tree leaned against this cabin and it took a whole weekend to cut it down! Wabanaki: Means "children of the light" and is named after the Native Americans of Maine. Wombles: Just rebuilt; named after mythical creatures living in the London Underground.